Artificial Intelligence (AI) and Machine Learning (ML) are hot topics around the globe. Artificial Intelligence and its subset Machine Learning have been disrupting diverse industries globally for quite a time now. Among all the industries, the banking industry also adopted Artificial Intelligence and Machine Learning solutions for different purposes. It is expected that the banking industry will benefit the most by incorporating AI systems in the coming years. According to the analysts, the banking industry is expected to save more than $1 trillion by the year 2030 because of Artificial Intelligence. AI and ML are currently driving some of the biggest industry changes in the banking industry. Almost all the processes of the banking industry have been automated by the AI and ML. Financial institutions have also started using chatbots and AI-driven responses to respond to the customers’ demands and interact with them. AI is also used to create risk management models for monitoring lending and credit risk and also for creating a fraud prevention model by identifying, tracking and flagging potential threats. These are just a few of the applications of AI and ML in the financial industry and their use is predicted to increase in the future. Banks have the hard-earned money of people deposited with it, which it lends to the borrowers in the form of loans. Being the depositor of such huge amount of money and loan provider, it is the priority of banks to protect the money from frauds and any kind of money laundering. According to the reports, for every $1 lost to the fraud, the banks $2.92 in recovery and associated costs. Artificial Intelligence and Machine Learning have made banks more efficient in detecting fraudulent activities. The tools developed using machine learning keeps track of the history of customers’ financial activities like transactions, amount, location, time of a transaction, etc. The machine learning algorithm uses this tracked history of a customer’s transactions to classify whether a transaction is fraudulent or not. As the banking industry is getting automated and therefore, it is more exposed to risk and external attacks. AI-powered models have been developed by the analysts for the specific purpose of risk management. For risk assessment, early detection of any threat plays the major role and AI recognizes the risk pattern pretty early creating awareness among its users about any kind of mischievous activity taking place. Using multiple data sources, AI takes a more comprehensive view of the risk assessment. On identifying the risk, it quickly responds accordingly and reduces the impact of failure to a great extent. One of the important and time-consuming tasks of financial institutions is to collect and analyze tons of customer data. With the help of AI-powered tools, banks can quickly collect customers’ data on purchases, channel usage, purchasing pattern, and geo-locational preferences to get a 360- degree view of the customer. Machine learning algorithms further allow the banks to do targeted and personalized marketing, allowing the teams to sell the right product to the right target audience sitting online. Customer service is another major part of every industry which decides the success of a company. Poor customer service is one of the chief complaints among the customers of the financial industry. Voice-enabled devices and ML chatbots have been around for a while and are successfully catering to the needs of the customers in real time and are promising AI applications. These ML powered chatbots adapt the approach based upon the behavior of the customers because of their learning capability. This gives a personal touch to the overall interaction between the customers and the chatbots. Although blockchain technology has automated maximum processes of the financial industry, still they have some limitations. By adding machine learning layer to the data processes, the FinTech companies can easily analyze data, interpret documents, and propose or execute intelligent responses. ML also audits the institution’s processes, making regularity compliance. The predictive power of ML can also identify the issues which need immediate attention of the team. Hedge funds are still popular among the audience but have moved away from traditional methods. Machine Learning algorithms have been adopted by financial institutions to practice fund trends. Machine learning allows the fund manager to identify the market changes earlier as compared to the traditional investment models and benefit the most. 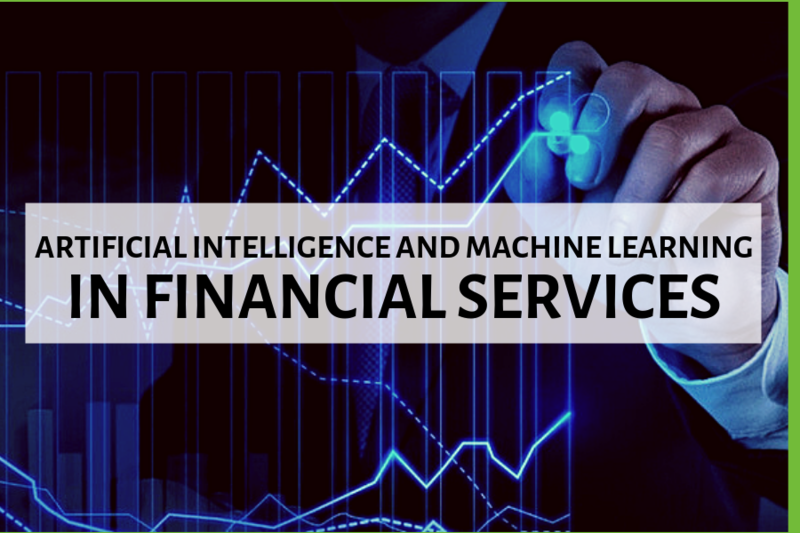 Machine learning has improved the profitability of the financial industries by making predictions based on the historical pattern of the customers and current trends. Whether an institution offers a loan, mortgage, health insurance or life insurance, machine learning has and will help in managing risks and reducing the underwriting risks. A simple algorithmic trading automates the trading process according to the criteria set by the fund manager or the trader. But, Machine learning turns algorithmic trading into intelligent trading because of the new and diverse suite of tools using the latest technology. RegTech uses ML for meeting the complex regulatory standards by reducing risks and enhancing compliance. Without any doubt, AI and ML are the future of the financial industry. The key trends and use cases mentioned-above give ample evidence that AI and ML have become an integral part of the financial industry. The speed at which AI and ML are making progressive steps towards automating the financial processes, it can be expected that AI provides better solutions for the financial industry.